Just like its gripping cover, Ironskin stopped me in place with dark mystery and a struggling, yet determined, heroine. Tina Connolly weaves a story with clever skill and fairy-tale appeal, a story that will regale and haunt minds long after its closing. Connolly grips and threads readers through the remnants of the terrible war between fey and humans while also focusing on Jane's conflicts, ranging from the depths of beauty to a mysterious romantic interest. 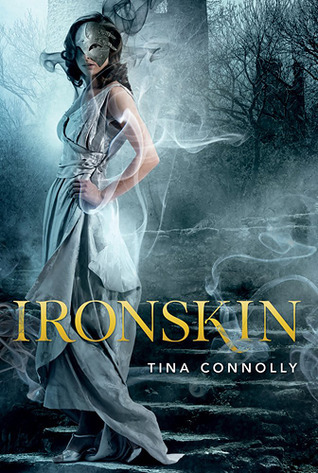 While lightly steampunk, Ironskin is heavy with supernatural intrigue. Jane Eliot's cheek is scarred and fey-cursed. The iron mask that covers the whole of one side of her face not only hides her deformity, but also the fey powered rage that reaches out to any surrounding her. Jane has an extensive presence and feels so much like a non-fictional person, someone filled with grief over the past, heavy with worry over present trials. She struggles with being on the outside of normal, self-conscious of the mask. For all her deep contemplations of who she is versus who she would like to be, Jane has a strength identifiable from the outset of the novel. A strength that grows as Jane works through what she wants and faces the dangerous fey she believed were gone forever. Jane works as a governess to the daughter of Edward Rochart. She's charged with teaching Dorie to stop using her fey-curse, moving objects without using her hands. The task proves to be more strenuous than she expected, yet Jane is set on helping Dorie and comes to learn more about fey, the fey-cursed, and the war that started it all. The plot moves smoothly and with purpose, every action leading to revelations that will cause chills to shiver across the reader's spine. From all that has been seen of fairies and magic nothing will surprise readers as much as Connolly's take on such elusive creatures. Fey are infamous for their nefarious desire to take over human bodies, dead of course, but their attraction to physical beauty and extraordinary talent takes the top spot for filling hearts with trepidation. A tale of empowerment and control, Ironskin will segue into a sequel even more haunting and mysterious!